Have you ever wondered what Heaven is like? Heaven is more beautiful than anything we could ever imagine. The city of God is made of pure gold and all kinds of precious stones. 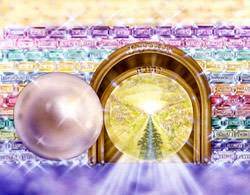 Twelve gates lead into the city, and the Bible says each gate is "of one pearl." In Heaven, there is no need of the sun or the moon, because the glory of God lights this land. From the throne of God and of the Lord Jesus there flows the river of water of life, clear as crystal. In Heaven there will be no sickness, no pain, no sin, and no death. There will be no sorrow, for God Himself will wipe away all tears from our eyes. Our loved ones who are there will know us and we will know them. 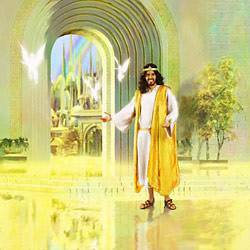 Best of all, we shall see our Savior, the Lord Jesus, who made it possible for us to be in Heaven. In Heaven, everyone loves and worships the Lord Jesus. You can walk the streets of Heaven for a million years and you will never hear anything but words of praise for Jesus. Heaven is where Jesus is. Jesus called Heaven "My Father's house." Those who love the Lord Jesus will be with Him forever in this wonderful place called "the Father's house." For those who refuse Jesus and will have nothing to do with Him, there can be no Heaven. 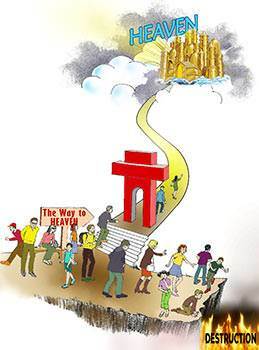 Jesus Himself is the way to Heaven, the only way. When He talked to His disciples about Heaven, Thomas asked, "How can we know the way?" Jesus said, "I am the way, the truth, and the life: no man comes unto the Father, but by Me" (John 14:6). Life is full of questions, but these are the most important questions of all, and the Bible gives us the answers to them. "The Lord God formed man of the dust of the ground, and breathed into his nostrils the breath of life; and man became a living soul [person]" (Genesis 2:7). Man is a created being. He did not come up from lower forms of life. Man was created as "a living person." Man is the highest of all God's creatures because he was created in the image of God. The Bible says, "So God created man in His own image, in the image of God created He him; male and female created He them" (Genesis 1:27). In the beginning everything was good and beautiful because God made it that way. God was pleased with His work. The Bible says, "God saw every thing that He had made, and, behold, it was very good" (Genesis 1:31). Today everything is not good and beautiful. There is hatred, fighting, stealing, lying, murders, wars, sickness, sin, and death in the world. What went wrong? Man turned away from God! Man chose to go his own way instead of going God's way. Even though man has turned away from God, God still loves man and wants to bless him. Man is God's special creation, made in the image of God. God has lost man, but He cannot bear to lose him forever. God made us to have fellowship with Him so that He could enjoy us and we could enjoy Him. But sin has separated us from God. God has given us the Bible so we can find our way back to Him. We are headed for eternity. You and I are going to live forever in one of two places—Heaven or hell. Where we live in eternity depends on the choice we make in this life. God wants us to choose to return to Him. God wants us to choose Heaven! Jesus told us that there are two roads in life. One road is a broad road leading down. Many people are on this road. The other road is a narrow road leading up. Few people are on this road. Jesus told us where these two roads lead. The narrow road leads to Heaven. The broad road leads to separation from God, in hell, forever. How terrible! To get on the narrow road to Heaven we must repent and take the Lord Jesus as our Savior. The Bible says, "God now commands all men everywhere to repent" (Acts 17:30). What does it mean to repent? To repent means to "turn around." The reason we need to "turn around" is that we have been going the wrong way. We have been going our own way instead of God's way. The Bible says, "…we have turned every one to his own way." When I can honestly say, "I see that I have been going the wrong way, but with God's help, I am turning to God," I have repented. This can take place in a moment's time, and it brings joy to God's heart. If you are not saved, dear friend, you are lost from God. But God loves you, and He cannot bear to lose you forever. You are very valuable to God. You can know how valuable you are to Him by what He was willing to do to get you back. 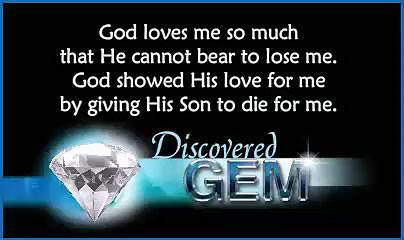 God showed His great love for you by giving His Son to die on the cross for you. But He will not make you come back to Him. You must choose to come. Perhaps, right now, God is speaking to your heart. If you see that you have been on the wrong road, turn around! 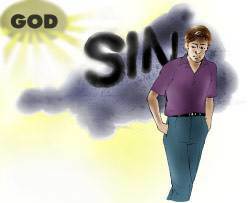 Say to Him, "Lord, I do not want to go the way of sin any longer. I want to go Your way, on the road to Heaven." 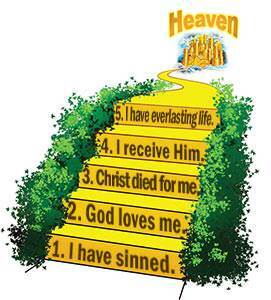 There are five steps that lead to the narrow road to Heaven. There are words on each step. Let us see what they say. Start at the bottom and read up. Pause a moment and read the steps again. Say them quietly to yourself. Now let us talk about them. We will have a Bible verse for each step. The first step in becoming a child of God is to learn what I am in God's sight and to accept what He says about me. God says that we are all sinners. We have all said wrong things and done wrong things. Sin is a terrible thing. It hurts us and it hurts others. But the worst thing about sin is this—sin hurts God's heart. Do you know why sin hurts His heart? Because God is holy; and because He loves us so much. We cannot undo a single wrong thing that we have ever said or done. We might wish that we could go back and change what we have done, but that is not possible. But we can be forgiven. The Lord Jesus can forgive you of all your sins, and He wants to forgive you. He is "the Friend of sinners." He will never turn away anyone who comes to Him. He said, "…him that comes to Me, I will in no wise cast out" (John 6:37). Whom does God mean when He says "the world"? He means all the people in the world. That includes you and me! Whom does God mean when He says "whoever"? He means anyone. You can put your name in this verse. Why not do it right now? For God so loved ____________ that He gave His only begotten Son that ____________ believing in Him should not perish but have everlasting life. Now read it out loud with your name in the blank spaces. There, that is good news, isn't it? This is good news: God loves sinners! God is saying to us, "I really love you! I have shown My love for you in giving My Son to die for you." God cannot overlook our sins or pretend that He does not know about them. What did God do about our sins? 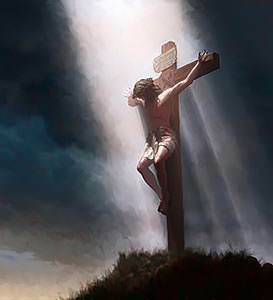 He paid the penalty of our sins Himself in the Person of His Son. The Lord Jesus Christ died for sinners. He died for you and He died for me. You can say, "Christ died for me!" Say it right now—"Christ died for me!" Not only did Christ die for our sins, but He also rose from the dead. He is a living Savior! He has all power in Heaven and on earth. He can forgive your sins and make you a child of God. "As many as received Him [the Lord Jesus Christ], to them gave He power to become the sons of God… " (John 1:12). To become a child of God, I must come as a sinner to the Lord Jesus and receive Him as my Savior. God has given Jesus to me to be my Savior, but I must receive Him; that is, I must take Him as my own Savior. I must make it personal. It is not simply, "We are all sinners," but "I am a sinner." It is not just, "Jesus died for sinners," but "Jesus died for my sins." It is not simply, "Jesus is the Savior," but "I take Jesus Christ as my Savior." When I take the Lord Jesus as my Savior, I become a child of God. 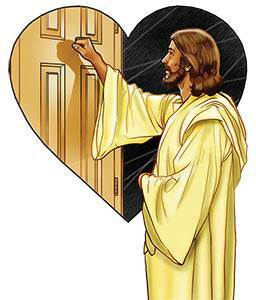 "Behold, I stand at the door, and knock: If any man [anyone] hears My voice and opens the door, I will come in…" (Revelation 3:20). "He that believes on the Son has everlasting life…" (John 3:36). This verse tells us that if we believe on the Lord Jesus, we have everlasting life. Say the verse to yourself right now— "He that believes on the Son has everlasting life." There, you understand that, don't you? We have been talking for a long time. Are you ready to make your choice? You want to choose the road that leads to Heaven, don't you? You can take Jesus as your Savior right now. You will always be glad that you did. "Lord Jesus, I know that I am a sinner. I know that I have been going the wrong way. I believe that You are the Son of God and that You died on the cross for my sins. Thank You for loving me so much. Please come into my heart and forgive me of all my sins. Right now, I take You as my Savior." We are saved by what God has done for us in the Person of His Son. When I believe that Jesus died for my sins and I take Him as my Savior, I am saved. God forgives me of all my sins and makes me His child. I have everlasting life. "These things have I written unto you that believe on the name of the Son of God; that you may know that you have eternal life…" (1 John 5:13). Whose word is this? It is God's Word, so we know that it is true. "In the world you shall have tribulation [trouble]: but be of good cheer; I have overcome the world" (John 16:33). We will have many troubles and trials as we travel to our home in Heaven. But if the Lord Jesus is living in our heart, we do not have to be afraid. He has promised, "I will never leave you, nor forsake you" (Hebrews 13:5). If you have taken the Lord Jesus as your Savior, please tell us about it. At the bottom of your Question Page, you will find a place where you can tell us of your decision. If you are not sure that you are saved, read this lesson over again and ask the Lord Jesus to make it clear to you. Remember, being saved is the most important thing in all the world. Jesus said, "For what shall it profit a man, if he shall gain the whole world, and lose his own soul" (Mark 8:36). Click on "Questions" below to do the quiz for this lesson. But before you do, you might like to check out some FAQs (Frequently Asked Questions) about the Christian faith.